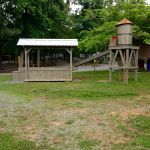 Ask fellow campers about "Lynchburg / Blue Ridge Parkway KOA" and nearby attractions. Question: We will be staying here this summer. Coming from Tennessee on I-81. Any suggestions on how to avoid the curvy, hilly route? We have a 41ft. 5th wheel. Answer: It was our experience that all routes were curvy and hilly! We stayed here the first week of October in site B13 pull-thru which was one of the easiest ones you may find. Utilities were good, but I have to say there alot of trees in the KOA & even a seasoned veteran coach driver may find the maneuvering a bit tight. 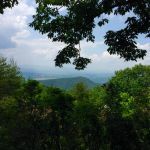 If you have satellite tv, I doubt that you will be able to get signal, but on the realistic side, you are literally minutes from the most pristine part of the Blue Ridge Parkway & the views are spectacular & there are quite a few of challenging hikes to do. Fuel & groceries are a bout a 30 minute drive to Lynchburg. You might want to note that around the time we were there, the park seems to have an issue with stink bugs that will find their way into your unit & by mid October, the Chinese ladybugs come to town in a large way. Other than that, the park owners are really nice & helpful & will do their best to see that your stay is good. We camped at Lynchburg / Blue Ridge Parkway KOA in a Motorhome. Very nice park and friendly staff. The site where we stayed was VERY close to our neighbor. Lots of trees and lot of things for children to do. We camped at Lynchburg / Blue Ridge Parkway KOA in a Fifth Wheel. Lost to do in the area, but be prepared to drive. This is a nice campground if a bit off the beaten path. The park itself is nice; very clean. We only stayed overnight and everything at our site worked great. It's about 1/2 hour from Natural Bridge and at least 1/2 hour from I-81. Roads inside the park can be a bit tricky. 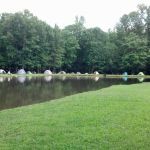 We camped at Lynchburg / Blue Ridge Parkway KOA in a Travel Trailer. We stayed in a premium pull through site. Manager and staff were very accommodating. Our site was roomy...but some looked crowded. The grounds were clean and nicely landscaped. Plenty for the kids to do...morning, afternoon and an evening activity! Nice catch and release pond. Clean swimming pool. It is a bit out in the country (which we liked). I would definitely stay here again! We camped at Lynchburg / Blue Ridge Parkway KOA in a Motorhome. This was our first visit to this KOA. The owners were onsite and very helpful. We took our granddaughters to participate in one of their Halloween weekends. The girls had great fun and the park seemed to be filled with RVers with the Halloween spirit. All sites in the park are gravel and there are lots of treee to provide shade in the hot summer months - there are 41 sites. They have a very nice enclosed doggy run - this was important to us! The park has a pond that seemed to have adequate fishing to meet my husband's needs. There were many Halloween related activities for the children and Saturday evening they had a mobile video game van for the kids entertainment. This park is less than 1 hours drive from our home. Yes, I think we will return next year. We camped at Lynchburg / Blue Ridge Parkway KOA in a Motorhome. Visit the Pie Shop about 5 miles down the road from the park (towards Madison Heights) - they are well known in the area and the pies are wonderful. The park is kept very clean. Sites are very close together so when someone has a campfire burning you get the smoke and it seemed everyone had a fire. The showers were clean until someone gave their dog a bath in the shower. Not well lite. Very dark walk to and from showers. Lots of campers with their dogs ,walking them around the park. Wifi was not strong enough to do anything. On website price was $41.75 but was charged $46.75. Will make sure I book on line next time I stay at a KOA. 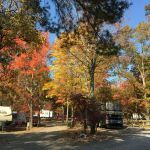 We camped at Lynchburg / Blue Ridge Parkway KOA in a Travel Trailer. This campground is about 2 miles from the Blue Ridge Parkway. The sites are close as are most KOA's, but there are tall shade trees. The owners are making important improvements yearly. We have been coming here for 5 years. In 2017 they added cable tv. The Wi-Fi is not strong, but my Verizon hot spot worked well with 3 bars. Lots of fun activities for the kids. Owners go out of their way to help campers who forgot something etc. Roads are fine with plenty of gravel. We camped at Lynchburg / Blue Ridge Parkway KOA in a Fifth Wheel. Blue Ridge Parkway is a great way to drive leisurely and see the mountains. Peaks of Otter has a restaurant about 1 hour south. Very nice location. Groceries are about 15 minutes away in Madison Heights. My wife and I have been camping at this campground for about five years now. They have made great improvements to the property over the years. Kudos! However, they made a major change to their guest policy for this year in that you may only have four guests at your site at any one time. If you plan on having more than four folks visit at a time, select another camp ground. We will be! We camped at Lynchburg / Blue Ridge Parkway KOA in a Travel Trailer. Friendly staff - escorted us to our site which was large and wooded. Since we drove to the park from the east, it was an easy drive. If coming in from the west, not so much - curvy, banked roads. Wifi was weak, we were given a slip with the passcode for duration of our stay. And no cell service, at least for our phones (ATT). We camped at Lynchburg / Blue Ridge Parkway KOA in a Travel Trailer. This is a great place for kids. Very nice layout. We camped at Lynchburg / Blue Ridge Parkway KOA in a Truck Camper. When your there go to Appomattox where HISTORY was made! See Jefferson's home,the nearby caverns the parkway the back roads. Travel and see AMERICA take your kids and read a book instead of the x-box. Nicely maintained park...Our site was mostly level and nice shade cover with trees. Wifi was non-existent. We were able to receive 8 channels with our antenna. Lot of up hill climbs and switchbacks to get to the campground. Kinda scary with a 39 ft 5th wheel. Found a different way out..Great destination park. We camped at Lynchburg / Blue Ridge Parkway KOA in a Fifth Wheel. We have been to this campground three times and will go many more. The setting is beautiful, close to the BRP, and bathhouses are very clean. We stayed in a deluxe cabin so we had running water and electricity. But we could easily stay in another cabin and been just as happy. The pool was awesome! The water was perfect for a dip on a hot day. I've seen other reviews where people were not happy about wifi or no cable. We go to get away so not having cable is not a negative. We want to be outside fishing, swimming or hiking. The wifi is fine and sending/receiving texts worked. It's 100% relaxing and a family campground so there were no loud parties and rowdy neighbors. The pond if fun catch and release fishing. The trails are fun, not for marathon training, simply to enjoy the outdoors. 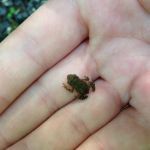 We found baby frogs which were so cute, thankfully no snakes. Oh there is a store for all the things you may have forgotten, we highly recommend the mystic fire, it changes the colors of the flames for your fire. So cool! They also have gem mining and my son was not disappointed. He found many beautiful gems and crystals and had fun doing it. I can't say enough good about this KOA location. It's open, beautiful, relaxing and highly recommend it to anyone looking for a getaway. We camped at Lynchburg / Blue Ridge Parkway KOA in a Cabin. Shops (walmart, dollar general, etc) and restaurants (Pizza, fast food, etc) are all about 25 min away. This is a nice clean and quiet campground a bit off the interstate. Stayed four nights and explored the area. Good location to see Natural Bridge,the caverns, D- Day Memorial and Appomattox Court House. Nice owners greeted us as we pulled in. Check in was easy and we were escorted to our site. Level gravel site with table and fire ring, plenty of room for slide out. Not much ground cover between sites but plenty of trees for shade. Restrooms were clean and are individual rooms with shower, toilet and sink. Wi-Fi very slow to non existent because of their location and being on satellite Wi-Fi. Campground gets busy on weekends. There is a pool and plenty of activities and games for kids. We would camp here again if in the ares. We camped at Lynchburg / Blue Ridge Parkway KOA in a Travel Trailer. We stay here 2 to 4 times a year. Owners are a delight. 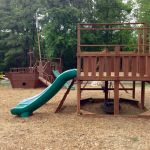 They have done so many improvements to this campground. Fishing, shuffleboard, nice pool, things for kids. They also have very nice cabins. It's one of the best KOAs we have ever stayed at. Everything is kept up beautifully. HIGHLY recommend it !!!!!!! We camped at Lynchburg / Blue Ridge Parkway KOA in a Fifth Wheel. Hiking on Blue Ridge Parkway. When your there go to Appomattox where HISTORY was made! See Jefferson's home,the nearby caverns the parkway the back roads. Travel and see AMERICA take your kids and read a book instead of the x-box. Appomattox and the Confederate Museum are nearby. Appomattox is a national park site so if you have a senior pass, you get in free. there is a fee for the museum. 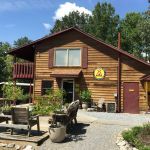 Are you affiliated with Lynchburg / Blue Ridge Parkway KOA ?